Some of the highest tides of the year, combined with a strong low-pressure system, could provide “King Tide” observers with ideal conditions tomorrow (Monday) for taking pictures of near-flood conditions or even flooding in some places. This is the third year the Washington Department of Ecology has put out a call for photos of high-tide conditions. 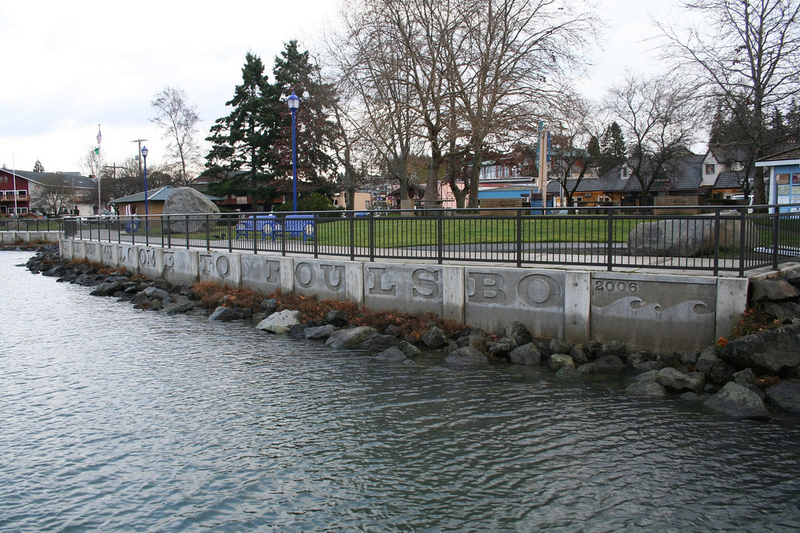 Photo of Poulsbo waterfront taken during “King Tides” Dec. 28, 2011. “Documenting how very high tides affect the natural environment and our coastal infrastructure will help us visualize what sea level rise might look like in the future,” states Ecology’s “Climate Change” blog. The King Tide photo initiative began in Australia in January 2009. Washington and British Columbia joined in 2010, followed by Oregon and California in 2011. Tide tables predict that tides in Bremerton and Port Orchard will reach 13.4 feet at 8:28 a.m. tomorrow. Check on other locations and other days in Washington state at Saltwater Tides. The National Weather Service has issued a coastal flood advisory for Western Washington because of low-pressure conditions, which could add 1.5 feet to the tide table prediction. That would put the Bremerton area at 14.9 feet. Check out the Weather Service advisory and the Kitsap Sun story. While it looks like we’ll have a very high tide, it probably won’t be a record. I was unable to find historical data for Bremerton, but the record high tide for Seattle is 22.4 feet on Jan. 27, 1983. The tide tables predict that Seattle will reach 12.5 feet tomorrow, or 14 feet with the added 1.5 feet because of the low pressure. Historical data can be found on NOAA’s “Tides and Currents” webpage after selecting a station. Shortly after I posted this, Jeff Adams of Washington Sea Grant sent me an email to point out that NOAA’s numbers need to be corrected by subtracting 7.94, because NOAA uses a different baseline than we commonly use in this area. That would place the record in Seattle at 14.5 feet, much closer to what we may see tomorrow. I should have known that something was amiss with that data. For more on this point, check out Jeff’s blog, Sea Life. King Tides will continue through this week, declining slightly each day, then will return on Jan. 14.